And now Brody has been turned into a limited edition print series. 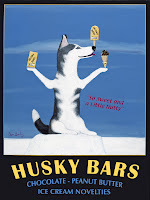 Husky Bars is now available as limited edition prints on my web-site in five sizes and prices. Go to www.kenbailey.com. Also products with this are available on my cafepress site Ken Bailey Shop. Hi! I saw your work in bigartblog.com. I must say, you are a breath of fresh air. I'm always on the look out for new and original artists. Keep up the goodwork!